Digitising 35mm slide and film collections is becoming increasingly popular as many archival institutions look to make the collections they hold more accessible. In addition some manufacturers are ceasing production of hardware for viewing analogue 35mm slides, a trend which is likely to continue, making it necessary to convert the content of slide and film archives to digital formats in order to preserve it. Due to the high capture resolution when digitising 35mm slides and film, even the smallest particle of dust on the slide/film can show up very large on the scanned image. This makes it vital to clean the slide with a bulb blower (or compressed air blower) before beginning the digitisation, to remove any loose surface dust. It is also important to clean the scanner bed (if using a flatbed scanner) or camera lens (if using a DSLR) with a microfiber cloth between digitising batches to mitigate the risk of dirt on the surface. Having digitised many 35mm slide and film collections, we have found that using a flatbed scanner (such as the one pictured) delivers the best balance of high resolution and consistent high quality images. There are alternative methods of digitising slides using a professional digital SLR camera fitted with macro lens; which is attached to either a planetary scanning rig and light box, or to a dedicated slide conversion adapter. These methods have their merits, the main one being they are generally quicker, however we find that flatbed scanning still produces the best overall image results. Note: You may have to remove a white document mat or add a transparency adapter to the hood (upper section) of your flatbed scanner in order to scan slides and film, depending on the model of scanner you are using. This information can usually be found within the scanners user manual or on the manufacturer’s website. Whether using a DSLR or Flatbed Scanner to digitise, making sure each 35mm slide or film strip is straight in its mount prior to scanning will save a lot of time deskewing the digital images during the post-processing stage. As we’ve noted in previous How to Digitise guides, it’s important to capture at a resolution appropriate to the goals of the digitisation project. As standard for 35mm slide and film collections, we recommend scanning to a minimum resolution of 4000ppi (pixels per inch), capturing 24-bit colour for colour images and 8-bit grayscale for black and white images. Digitising at this resolution provides an optimum balance of capturing enough pixel information for detailed display on monitors, whilst keeping scanning times and costs reasonable. This resolution also allows the images to be blown up to larger sizes (i.e. for reproduction of photographic prints) with little or no interpolation, minimising the likelihood of any distortion appearing in the image. For long-term archival preservation purposes we would normally recommend a resolution of 4000ppi or above, in line with The National Archives Digitisation guidance. However we are aware that practicalities of available time and budget resources weighed against specific project goals and short-term outputs, are key considerations that will influence this. Whilst scanning at 4000ppi resolution does produce relatively large files, which can be cumbersome to work with, lower resolution surrogates can be derived from the master images for display on the web or to transmit via email. Different models of scanner can interpret colour values differently, which can lead to inconsistencies between the apparent colour profile of the physical slides/film to the human eye and that of the digital images they produce. For this reason colour calibration must be performed before scanning your slides to achieve the truest representation of the original materials. Assuming monitors have been calibrated beforehand, a basic level of calibration can be performed by scanning a colour target (like the one pictured) and adjusting the colour profile of the scanned image to match the physical chart. This profile can then be applied across all of the 35mm slides/film strips. An alternative option for more accurate colour calibration is to use a professional scanning software package, such as the one we use, SilverFast AI Professional. This program operates in much the same way, by scanning a colour chart, but uses a more accurate computer algorithm to detect and match colour profiles instead of relying entirely on the (less reliable) human eye. 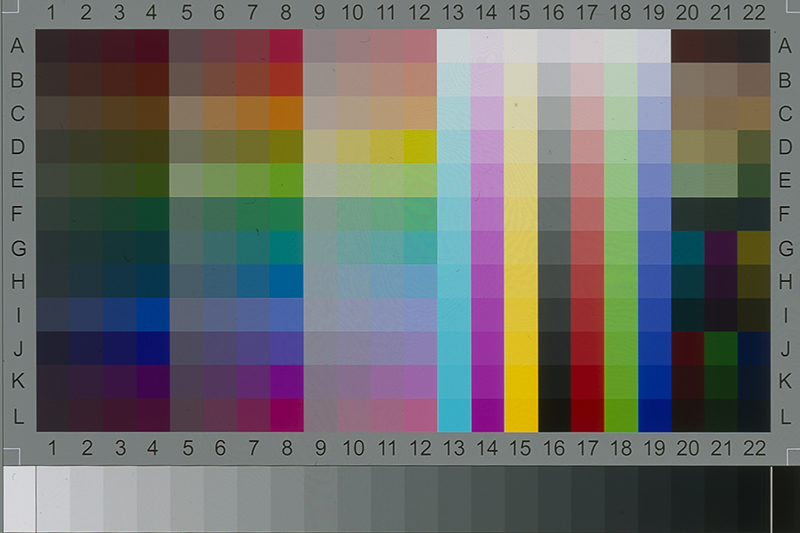 For a full in-depth guide on colour management in digitisation projects please see the JISC digital media infokit. 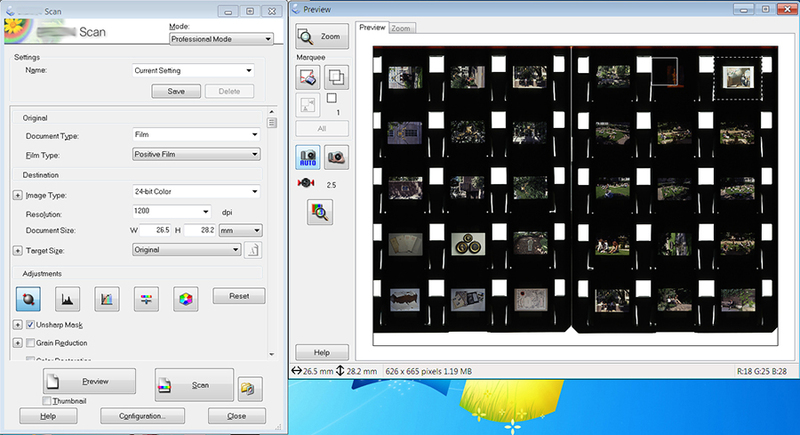 In line with JISC guidelines we recommend digitising slides and film to uncompressed RGB TIFF format as master images. Smaller surrogate JPEG files at 80% quality can then be produced for image manipulation, display online and other uses (as noted in point three). Most professional flatbed scanners will include their own proprietary software to control the scanner hardware, process and settings. When digitising slides these programs often have an option to detect and auto-crop individual slides from the scanned image and separate them out into individual image files. Whilst this is a very useful tool in principle, our Imaging Technicians have found that with many scanners it can be unreliable and inconsistent – in some cases cropping out parts of individual slide images. For this reason we recommend performing an initial preview scan of your slides/film, then setting the crop areas manually (as in image below). Though this may sound time consuming, we believe it is the best way to ensure perfectly cropped scans. 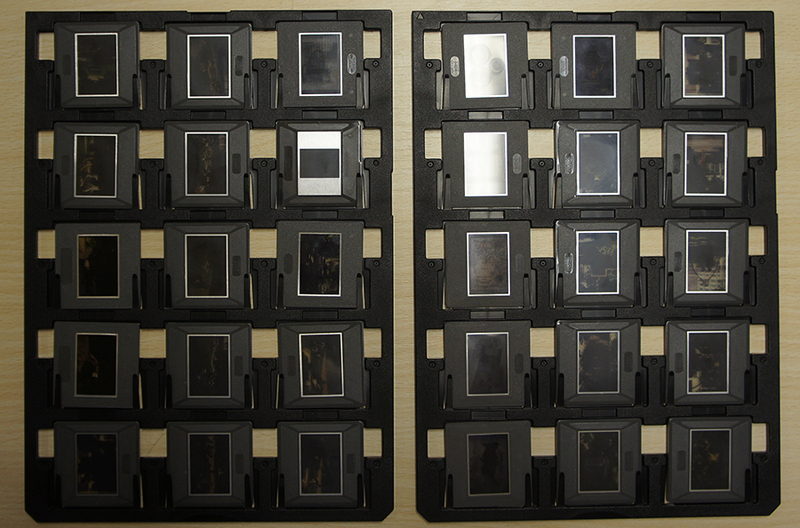 Considering digitising a 35mm Slides or Film collection? You can find more information on our slide scanning service on our 35mm Slide Digitisation page, or if you have specific questions you can contact us and our consultants will be happy to help. You can also find our best practice tips for digitising book archives, photograph collections, and glass plate negatives in our other How To Digitise guides. 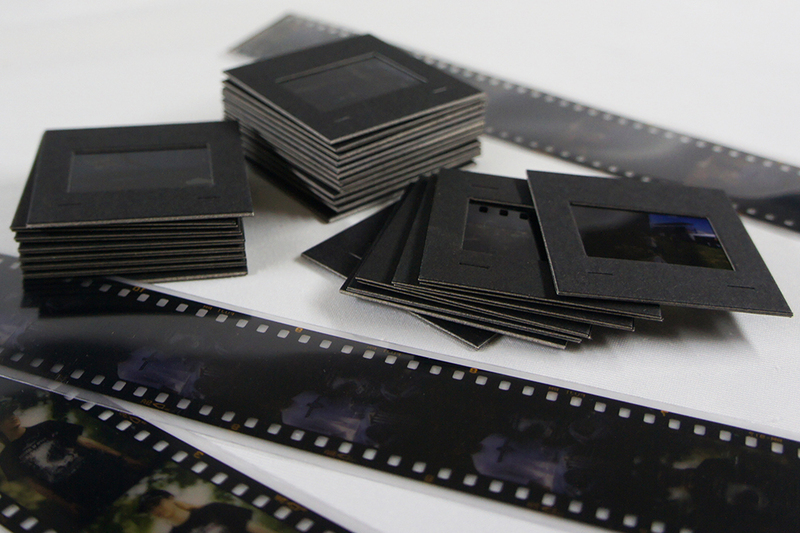 Are you looking to digitise your 35mm slides?